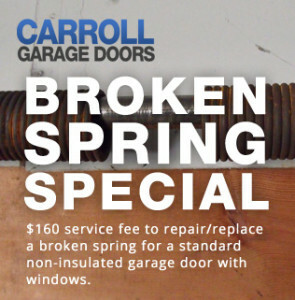 Because of our strong commitment to safety, Carroll Garage Doors is an excellent choice for garage door spring repair. Our fully trained technicians have the special tools and expertise required to remove broken springs safely, without risk of injuring themselves, damaging your property, or exposing you to liability issues. 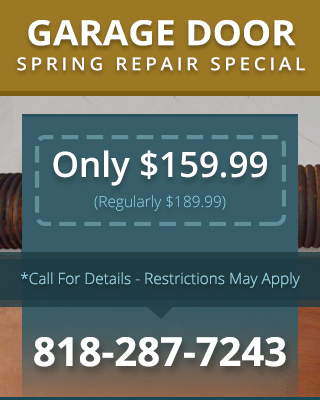 If your garage door springs need replacing, don’t risk your safety trying to handle the job yourself! Instead, call in the pros. We’ll get the old spring removed safely and the new spring or springs installed correctly. If you have custom garage doors, you can protect your investment by getting expert maintenance and repairs. As a manufacturer and installer of custom doors ourselves, Carroll Garage Doors is an excellent contractor to use when you need custom garage door repair & service Northridge CA. Regardless of what kind of custom door you may have, we can help keep it in top condition. We can also provide assistance will all kinds of garage door openers, for custom and brand name doors. Just give us a call to schedule an appointment for your repair and we’ll get the job done as soon as possible.